I have come to the conclusion that once the temperature reaches 0C that it doesn’t matter how much lower it gets. Cold is cold! We should be thankful, I suppose, that at least the temperature increases during the day to being quite pleasant, and of course with the intense cold we get these beautiful blue sky days. The information on Banksias is truly incomplete. Many books will state categorically that particular species will grow only in acid soils. Until they are grown in soils of different pH and tested, we do only have this information to rely on. 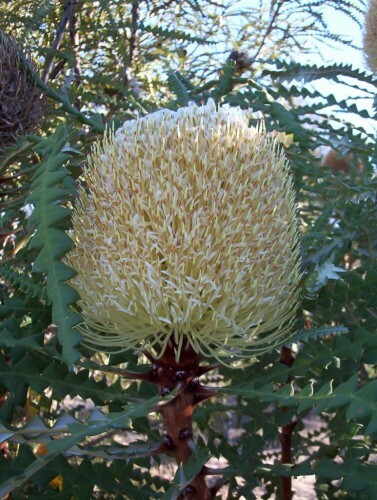 I have updated this post with a photo of a Banksia I would like to grow at home. This one is at the Arboretum where pH is closer to neutral. One of my aims is to try a variety of Banksias, using additional sulphur if necessary. I originally wanted to grow only those plants which grew well in highly alkaline soils. The problem is that I want to see good growth on all the plants and want to intervene if necessary. I will still have the restriction of rainfall to contend with any way. Record keeping is the key to making this a useful exercise. I certainly want to have Banksia coccinea and Banksia menziesii in the garden. Theoretically, the frost finishes tomorrow until the next bout! Another beauty today had me trying twice to get out of our driveway without the windscreen icing over. Yet everythingÂ that I am growing is looking ok, amazingly. I must say that I have a ‘nasty suspicious nature’ when I read such things asÂ ‘frost tolerant, drought tolerant, lime tolerant’ etc. Until I have the evidence for myself, I am always wary of other people’s assessment of these qualities. Unless I know the geography of the area where a species naturally grows! Or I know the climate of a particular nursery eg. one from an area of high frequency of frosts that come with very low temperatures. I have read various claims about seaweed type products improving the frost tolerance of young plants. Having read it, I thought I would deliberately try the products, not only for their usefulness in settling in new transplants but for this quality as well. I cannot say that I have set up a very scientific system of measuring this. I am more interested from the point of view of a home gardener as well as a nursery grower so it will be purely anecdotal. This is the coldest winter we have had for a few years. Recently there have been 5 frosts in a row and this seems to be the pattern. Apart from 7.5mm last Friday there has been no rain so the potential for damage to plants is increasing as this dry weather continues. It is a standing joke amongst Australian native plant growers that if it will survive in Canberra during the winter, it will survive anywhere. When we first moved here, the small publications published by the National Botanic Gardens were a bench mark for frost hardy plants. Many more plant species have been available since these books were first published (from 1971), so the original list is quite small in comparison with what is known today. Acacia drummondii (Drummond’s Wattle) -needs protection from frost until about a metre tall. I will add to this list later and find more cultivation information. I am beginning to think that variegated plants are not as frost tolerant as their plain leaved relatives. The variegated form of Pandorea jasminoides looks a little the worse for wear at the moment. The upper leaves look ‘soggy’ compared to the older leaves and the plain Pandorea in the pot next to it has not been touched by frost. A similar thing has happened to Correa ‘Dusky Bells’ variegated form. The plain form is as tough as old boot leather. The other consideration is that the potted plants are in more active growth than those in the ground and are producing new growth more often. I hope it is just the new growth that is the problem, otherwise I am in trouble with the rule I set for myself. Plants I grow have to be frost hardy and relatively drought hardy, unless I choose to deliberately break this last rule, knowing that extra water will be required. The first rule is not negotiable. I may have a management problem to overcome in the future as these plants are grown in the open.